In 2008 in California, Proposition 2 hit the ballot. It was a law that seems like it should already have been on the books, requiring that for the majority of the day farmed animals should have enough room to be able to stand up, turn around and lie down. Animal advocates everywhere dropped what they were doing, rerouted their donations, and fought for this measure. One hope of supporters of Prop 2 was that it would educate people to the horrors of factory farming, particularly in the egg industry. One argument of animal rights advocates who opposed Prop 2 was that it might increase demand for animal products since people will feel that the eggs, dairy and animal carcasses they buy came from happy animals, which in turn might lead to the greater consumption of these products. Cage free hens. And this is the improvement? The welfarist argument will be that Prop 2 was successful because at least the demand is shifting to “more humane” methods. 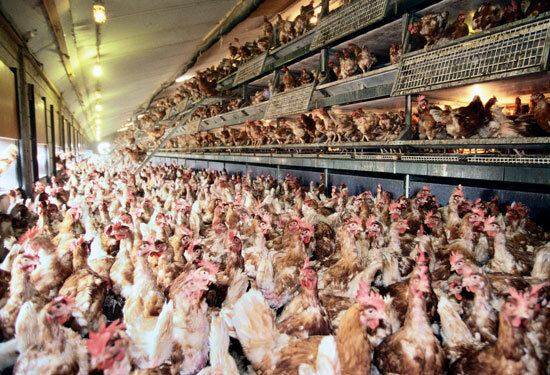 The problem is that neither cage free nor organic are humane. Unless sales of eggs go down drastically, we have a problem because, regardless of whether eggs are conventional, cage free or organic, a number of horrific things happen in their production. No matter what “type” of egg you buy, the egg industry imprisons hens in a space that is painfully small. Only hens that produce organic eggs have access to the outdoors. However, even then access may not be utilized by hens for reasons such as access doors may be small and daunting as the light coming in is extremely bright compared to the dark sheds in which they live, or the space may be too limited for all hens to use it. No matter what “type” of egg you buy, the egg industry depends on hatching new laying hens. All male chicks that are born are useless to the money making goals of the industry since they can’t lay eggs. Because they can’t make the egg industry money, all male chicks are killed. This typically happens in one of two ways: they are thrown with hundreds of other chicks into plastic bags and suffocated or they are thrown alive into a grinder. No matter what “type” of egg you buy, the egg industry will cut body parts off of live chickens without giving them any anesthesia. Caged, cage free and organic conditions all place hens in extremely overcrowded living spaces, which psychologically damages them and often makes them go insane. Hens often peck or fight in response. Rather than allow the chickens decent lives filled with sunshine, space and dust bathing, the industry removes the body parts that can cause a laying hen injury to herself or other hens should she happen to go stir crazy. This includes the ends of her beak and her toes. A hen’s beak is filled with nerve endings—having her beak cut off is akin to you having your fingers cut off. No matter what “type” of egg you buy, hens are starved at regular intervals to put them in a state of panic that will force more frequent egg laying. No matter what “type” of egg you buy, hens are kept in extremely dark conditions to make them think it is nighttime so they will make less noise. No matter what “type” of egg you buy, the industry will kill all hens when they are between one and two years of age, when they stop producing eggs at a high rate. Hens can naturally live up to 10 years. This means they are robbed of, on average, 80% of their lives. No matter what “type” of egg you buy, you are buying the amniotic fluid of another animal. The idea behind Prop 2 was to create more favorable conditions for animals while we wait for our society to wake up and recognize that imprisoning, torturing and murdering others is wrong. The idea behind Prop 2 was to create more favorable conditions for animals while we wait for our society to wake up and recognize that might doesn’t make right. The idea behind Prop 2 was to create more favorable conditions for animals while we wait for our society to wake up and recognize that eating meat and animal products are the root of all of the leading causes of death and disease in this country. But the facts are there and people choose willingly not to change. Though it is not what Lusk concludes (he thinks that Prop 2 helps animals), what his study on Prop 2 has proven for me is that given a choice people will do whatever eases their conscience, but only to the degree that they don’t actually have to make a real change in their lifestyle. Most people are too stubborn and confused to stop actually exploiting animals. People will spend a few extra cents to for the peace of mind that they can pretend like they do not support the cruelty toward or torture of animals. But in the end, humane “meat” is a myth. The only humane choice is to refuse to kill or imprison for food. Bigger cages are still cages and I am fighting for freedom. Prop 2, I personally thought, would be an eye-opener for the average Joe/Sue. I was hoping that one the news about the prop got around, people would do some digging on their own and find out about the horrors of the meat/egg/milk industry. I was hoping that more people would have been so affected by it that they would become veg*ns because of the horrible conditions the animals are put in. Did we really have to wait for stats to come in when you can use logic to realize when something is terribly wrong? I did NOT vote for prop 2 and thought it would be the biggest disaster for farmed animals as it… will only increase demand as people will feel better about eating and buying animal products. Although I agree with you that cage-free is no guarantee of welfare improvement – I have to disagree when you imply that responsible, caring animal husbandry isn’t beneficial to domesticated animals. You should check out some of Temple Grandin’s work with animals. An animal in the wild is likely to suffer from disease, stress and predators. Good farmers provide their animals with a safe, comfortable life. Think about your own death – would you rather be torn to shreds and tormented in the last minutes of your life by wolves, or would you rather have a quick, painless death with no anticipation or anxiety? We have the ability to help our animal friends live better lives. Taking the all-out, full liberation vegan approach is not the best solution. Vegina – Just wanted you to know, I recently posted your “prop 2” blog entry on AR news (Google groups) in light of the Egg Products Inspection Act. I feel that it is incredibly useful in analyzing the the current rhetoric (that is reflective of Prop 2) of “bigger cages” and “humane” treatment and the Act’s actual results/consequences. I was wondering if you were going to do a follow up post about Egg Products Inspection Act? Your research and statistics I think would be helpful in giving a real perspective of this Act before it even passes. I personally think the movement is fighting over bread crumbs and we should be demanding more of ourselves for the animals, however I was appalled at the presentation given by Farm Sanctuary’s Nick Cooney at the AR Conference (which I can not find the video, for now). Specifically for the “graphs” and “stats” given in support of animal welfare and how welfare is “effective” above all other forms of actions for animals. I could not help but think how you would have vomited at the mere presence of his data inaccuracies and comparing cause and effect that could have come from several sources outside of animal welfare legislation (such as people in the EU eating less animal products after certain welfare measures were passed, however there was no timeline in which this happened nor could this be the only reason why people were eating less animal products).